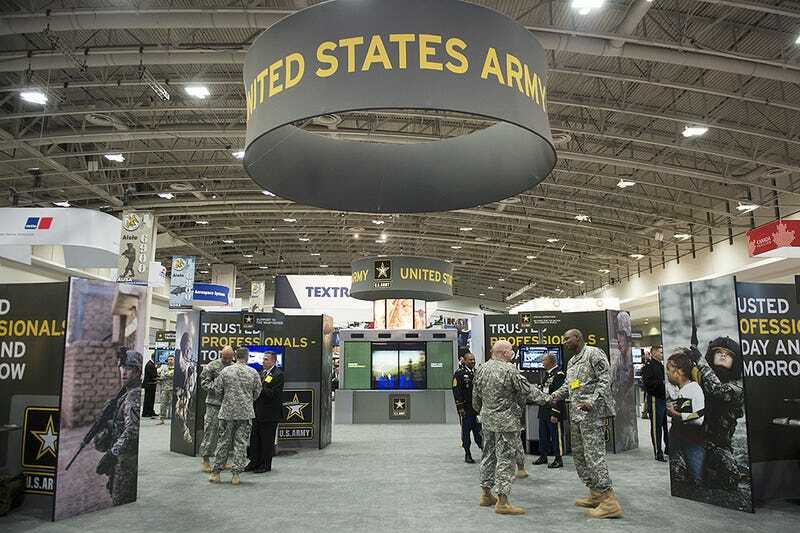 The Association of The United States Army throws its big land warfare expo every year, and this one seems to have some interesting trends. Believe it or not, color tones are one of them, and it has a lot more to do with warfare settings changing than you might think. Specifically, we’re talking about the color tones that defense contractors use to showcasing their latest weaponry. Green appears to be the new tan when it comes to displaying in-fashion tactical vehicles and weapons. This is not to say that there is no tan to be found, but there surely is more green than there was in years past. This observation was made by fellow defense writer Kevin Baron, who Tweeted about it from the conference’s exhibition hall. This changing of the military’s camouflage tones is largely a sign of the times. The U.S. has a much smaller presence in Iraq than it did in the last decade and it is not even a combat one. Over in Afghanistan, as the Army draws down its posture to a skeleton force, the idea that environments that dictate tan camouflage will be where our troops and equipment will likely end up for tomorrow’s war is quickly fading. This is only exacerbated by the fact that NATO-Russian relations are largely in a shattered state, a reality that has resulted in continuous U.S. deployments to Europe under Operation Atlantic Resolve over the last year and a half. During some of these deployments, American armor stuck out like a sore thumb with its tan color. But this is changing as some Army units are being ordered to adapt their equipment’s paint jobs to Cold War-like European warfare sensibilities. This includes assuming the woodland camouflage pattern that many will remember from the Cold War era. Although this camouflage pattern has not disappeared entirely from U.S. military over the last few decades, tan desert schemes on military vehicles and uniforms have been regular fixtures on nightly newscasts and spotlighted in popular culture from Operation Desert Storm in 1991 to the present day. This has made any other military camouflage almost seem non-existent, unless you live on a base where it is used daily, that is. In addition to the geopolitical realities abroad, the Pentagon and the Obama Administration’s repetitive declarations that they are not interested in fighting another land war or counter-insurgency in the Middle East anytime soon has not fallen of deaf ears. As a result of these and other inputs, defense contractors are looking toward greener theaters of operation to make a buck in the future. These could be the forests of eastern Europe or the jungles of the Pacific, either way they don’t dictate tan everything like the deserts of Iraq and Afghanistan have for the past decade and a half. Just like anyone that is good at selling their wares, defense contractors show their products in the most relevant way possible. The fact that this is increasingly in green motifs reminds us of just how fast the strategic picture is changing for the U.S. military. For better or for worse.